What do you want from your Business Plan? "I want to find investors" "I want to get my act together" "I want to write my own plan"
leap in the dark - The Business Plan Expert can tell you how best to attract financial backers for your new business. Teamwork and timing are crucial to your success. The Business Plan Expert can tell you how get your show on the road in the fastest time. 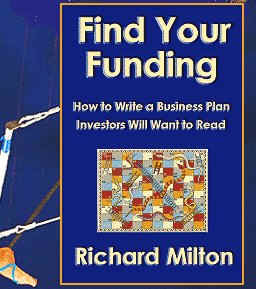 Learn the secrets of writing a plan that investors will want to read. 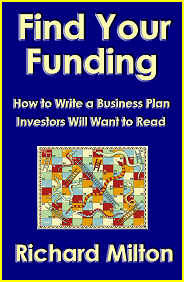 Let The Business Plan Expert show you how to Find Your Funding with this new book. How to plan a business? issue that you may have to deal with. forecasts and your marketing plan. performing during its formative stages. conception from your rough sketches. Can you write your own plan? Investors will want to Read. professional to write your plan. eye over the important figures. what about your cash flow forecast? for their product or service. What goes in the business plan? saying what need it fulfils. competitors already in the marketplace. products available on the market. how you are going to sell it to them. the team bring to your new venture. must spell that out for them. market place and your competition. capabilities of your management team. Spell out your marketing plans in detail.